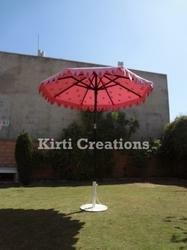 We are involved in bringing to the clients Garden Umbrellas that can provide cool shade and can bear the heavy wind. The Garden Umbrellas are fabricated from superlative quality fabric and are available in a variety of shapes, sizes and colors. Our multicolored Garden Umbrellas are brought to the clients at affordable rates. These single-tier umbrellas are 2.5 meters tall with an open diameter of 1.7 meters. The umbrella tops are hand-stitched satin or cotton, tightly stretched over bamboo slats and crowned with a durian wood (Durio dulcis) carving finished in a gold or sliver motif. The same motif and paint finish is repeated on the umbrella stem. 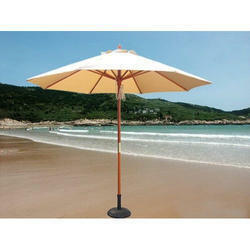 We are offering an wide range of Garden Umbrella. We are using high quality raw material for made this product. These are available in various colors and design. These are appreciated by clients for its high tear strength and is durable in nature. Available at market leading price.